1 The five powerful mantras of Lord Shiva. 1.5 KARPUR-GAURAM KARUNAAVTAARAM SANSAAR-SAARAM BHUJAGENDRAHAARAM SADAA VASANTAM HRIDYARAVINDE BHAVAM BHAVAANI SAHITAM NAMAAMI. 2 HAR HAR MAHADEV हर हर महादेव! Practicing Lord Shiva powerful mantra in the prayer & meditation helps people to purify the mind, body & soul. Shiva mantras fill people with positivity, intellect. Lord Shiva mantra unites people with blissfulness. Everyone is free to implement Shiva mantras. In this post, we have describes powerful Lord Shiva mantras which can help you to overcome all the miseries of your life. To take the benefit of Shiva mantras one has to keep faith in Shiva. By keeping trust on Shiva, the mantra will affect you faster. The five powerful mantras of Lord Shiva. Om Namah Shivaya is also known as the Panchakshari mantra. It is the significant mantra of Shiva; Aum Namah Shivaya attached with the five essential components of the world NA - MA -SI - VA - YA. It is a sacred mantra dedicated to Maha Rudra, and Lord Rudra means the fierce form of Shiva. All the Shiva mantra creates the cosmic energy per second, and Rudra mantra is the dominant sound wave. It gives inner strength and courage to handle all the life issues. Truth is one, sages say it differently. Rudra mantras also related to Sankat Mochan, as we know Lord Hanuman is also the eleventh Rudra Avatar of Shiva. For specifically worshiping deity Hanuman, people can chant specific Hanuman mantra-like om hanumante Namah. It doesn't matter which form of Shiva you meditate or pray it will ultimately reach to one supreme consciousness. Rudra mantra takes care of persons physical, mental health. Chanting the Rudra mantra gives them a feeling of beatitude and protects them from negatives energies. These waves also improve human intelligence to the optimum level. Mantra is known as Shiv Gayatri mantra. A significant vibration originates in the subconsciousness part of the mind which gives the feeling of inward ecstasy. The mantra helps in controlling the Senses and anxieties of the people. This mantra is known as the Mahamrityunjaya mantra of Shiva. It is ancient Vedic mantra impersonated by sage Markandeya. Mantra helped sage by protecting him by the instant death. 5 -KARPUR-GAURAM KARUNAAVTAARAM SANSAAR-SAARAM BHUJAGENDRAHAARAM SADAA VASANTAM HRIDYARAVINDE BHAVAM BHAVAANI SAHITAM NAMAAMI. It is an effectual mantra of Kailash Nath chanted during the time of Shiva Arati. Mantra honors the Shiva and Shakti for the graciousness. Mantra defines Lord Shiva attributes, It reveals Shiva skin color tone as White camphor and personifies Shiva as the Avatar of compassion and generosity. HAR HAR MAHADEV हर हर महादेव! This mantra is the also the most famous mantra of Shiva. This Shiva mantra represents Shiva as HAR. Lord Shiva means the auspicious one, the remover of all sufferings. By chanting har har Mahadev, devotees request Shiva to fulfill their wishes and removing all the griefs. Lord Shiva mantra helps people to get connected with Shiva. Chanting Shiva mantra removes negative energies and fills people with positivity and inner strength. Chanting powerful mantras of deity Shiva helps people to enhance their physical and mental health. Shiva is the giver of success, wealth and fortune. Chanting shiva mantra brings glory to the family members. Mantra also helps to attain the cosmic siddhis like the awakening of Chakras . Now you know about the Shiva mantras, but if you are not aware of Lord Shiva, then, these mantras will not help you in limited aspect. To leverage the benefit one must build the bond of affection and love with Lord Shiva. Before taking the advantages of Lord Shiva mantras, let us have a look at the glimpse of Shiva greatness so that we could truly understand why these mantras are helping us? Only a few points are sufficient to understand the greatness of Shiva. Lord Shiva is Hiranya Roopaya, the creator of Hiranyagarbha. It is the place from where the process of creation started. Therefore Lord Shiva history is united with the origination of the cosmos. Shiva is great God in the Santan Dharma known by the name of Mahadev which means the Lord of Lords. In the fierce from Shiva is Catastrophic Rudra, the one who is the mightiest force of the universe and known as Mahakaal. In unmanifested form known as Sadashiva worshipped as the lingam; and for iconographical representation known Shankara. Lord Shiva consumed the cosmic poison to protect the universe from the adverse effect of the Halahala. Shiva is unique; there is no one like Shiva. He is known for his simplistic nature and unique style which makes him different from others. Shiva is the dispassionate Lord of yogis known as the Vairagi but operates as the destroyer of the darkness . Shiva is the loving husband of Goddess Shakti, Collectively with Gauri both known as Shiva-Shakti. He is known for managing the balance of positive and negative energies. Lord Shiva is the one who is most dear to Lord Narayana, Therefore, known as Vishnu Vallabham . Although, Shiva is the ultimate transformer, the omniscient, and infinite Lord in all aspect. Qualities of Lord Shiva makes him the most loved lord in all over the globe. 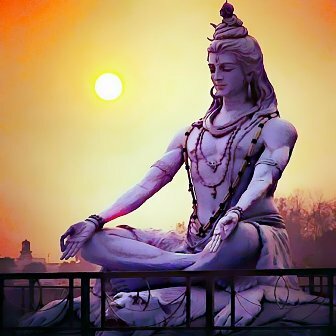 In this post, we have shared Lord Shiva powerful mantras. If you liked the post, please feel free to share it on the web. Your single share will help people to implement the Vedic culture in their lives. People will come to know that they belong to the fabulous culture based on godly science.